Harry Ernest Allison was born in 1882 in Hawsker, near Whitby. He was the son of William Allison, a butcher, and Margaret Jane Watson. William had previously worked as an agricultural labourer in Hawsker, and Margaret’s family was from the same locality. The couple were married in 1879. Harry was the third of their five sons: William George (born Watson), Arthur Edward, Harry Ernest , Walter Edgar and Septimus Charles. Over the next ten years and more, the family lived together in Hawsker. In 1901, when Harry was nineteen, he was still living in Hawsker, but with his grandmother, Mary Watson. Mary was seventy years old, and a ‘cowkeeper’. Mary’s 28 year old son Arthur Watson was also in the house. He was listed as a butcher, and his nephew Harry was a butcher’s assistant. Harry’s parents and two younger brothers were living nearby. By 1911 Harry had moved to Stokesley. He was 29, single, and working as an assistant to William Farrow the butcher. Harry was also lodging with William Farrow and his family, but had romantic interests elsewhere in the town. On 12th February 1912, he was married to Kathleen Maude Smith. Kathleen was the daughter of Joseph Smith who had been a veterinary surgeon in Stokesley since at least 1888. Kathleen had been born in Monmouth, and was just two years younger than her husband, so it was a late marriage for them both. By the time their daughter Maude Margaret was born on 14th April 1914, it was late for other reasons. The Great War was less than four months away. Harry Allison’s attestation papers were approved on 15th June 1916 in Great Yarmouth. He was posted to Portsmouth in June 1917 where the No 9 Coastal Fire Command was based. On 20th September 1917, Harry was posted to anti-aircraft artillery, and from then until his death, he was with North Sub Command in London and served with various AA units including the 44th AA Company and 43rd AA company. Back in 1914 when the war began, there had been no AA (Anti –Aircraft) Artillery units. The idea of an aerial assault on the British mainland had never even been considered. The Germans, however, realised that in their Zeppelin airships (and later their Gotha bombers) they had weapons of great potential, and their early raids along the eastern coasts struck terror into the civilian population. As soon as it was apparent that Britain could be attacked from the air, suitable guns were sought for the defence of the realm. The navy initially provided guns which were manned by RNVR crews. Early AA weapons were experimental in nature so the success rate of these AA crews was at first rather disappointing. Later, guns were operated by RGA crews with drivers and motor lorry crews provided by the ASC. This alone did not solve the problems of AA batteries. In order to hit their moving target, gun crews had to try to calculate where that target would be some 9 – 18 seconds after they had fired their gun, and fire at that position rather than at the target itself. Nevertheless, defences improved and by June 1916 there were 202 3” 20 cwt guns deployed in defence and a total of 371 AA guns in all. Ironically but by no means uniquely, Bombadier Allison’s demise did not come as a direct result of war. On 18th October 1918 he was admitted to 1st Eastern General Hospital, Cambridge suffering from influenza. In the early years of the last century, this was a very serious disease, and periodic epidemics carried off millions in Europe and elsewhere. Bombadier Harry Ernest Allison died on 21st October, 1918, only 3 days after his admission. Hospital notes survive, recording that he was suffering from a right middle ear suppuration, and that there was a ‘small mass of granulation tissue in middle ear cavity – which is partly organised into scar tissue’. The records state Cause of Death as “Influenza and bronchial pneumonia”. Bombardier Allison died just three weeks before the Armistice. He was buried with military honours in Stokesley Cemetery. He was 37 years old and one of 2 brothers who served. 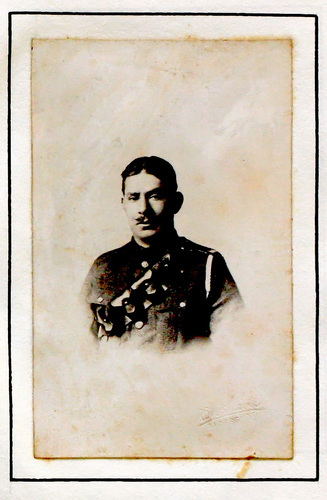 (The other was Septimus Charles - Private M2/120597 ASC - who survived the conflict). Harry Allison left a widow and a daughter, and by his will his widow Kathleen received his effects to the value of £146 3 shillings and threepence. A grateful nation later granted Kathleen and her daughter a pension of 21 shillings and 8 pence per week from 28th April 1919.